A statistical model shows several interesting properties of U.S. jury configurations. (ISNS) -- Could different jury sizes improve the quality of justice? The answers are not clear, but mathematicians are analyzing juries to identify potential improvements. Nowhere in the U.S. Constitution does it say that juries in criminal cases must include 12 people, or that their decisions must be unanimous. In fact, some states use juries of different sizes. One primary reason why today's juries tend to have 12 people is that the Welsh king Morgan of Gla-Morgan, who established jury trials in 725 A.D., decided upon the number, linking the judge and jury to Jesus and his Twelve Apostles. The Supreme Court has ruled that smaller juries can be permitted. 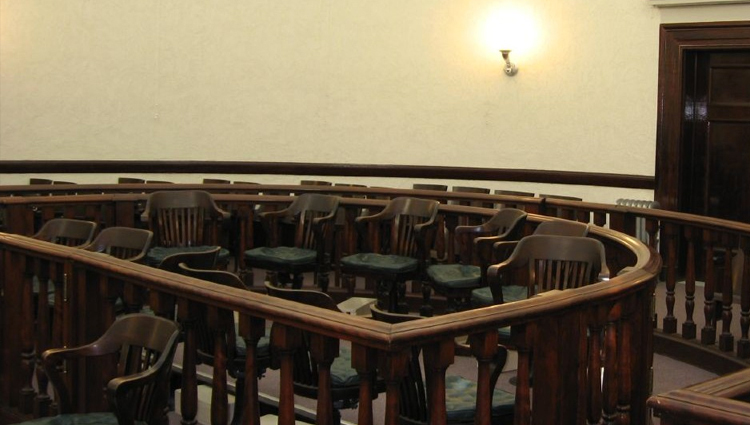 States such as Florida, Connecticut and others have used -- or considered -- smaller juries of six or nine people. In Louisiana, super-majority verdicts of nine jurors out of 12 are allowed. However, in 1978 the Supreme Court ruled that a five-person jury is not allowed, after Georgia attempted to assign five-person juries to certain criminal trials. To mathematicians and statisticians, this offers a clear division between acceptable and not acceptable, and therefore an opportunity for analysis. "What seems to be apparent reading the literature on this is that the Supreme Court is making these decisions basically on an intuitive basis," said Jeff Suzuki, a mathematician at Brooklyn College in New York. "It's their sense of how big a jury should be to ensure proper deliberation." At a mathematics conference earlier this year, Suzuki presented research comparing the likelihood of conviction of a hypothetical defendant with the same likelihood of guilt but different jury conditions. Building on a well-established line of research, which began with 18th-century French philosopher and mathematician Nicolas de Condorcet, mathematical analysis of juries has continued over the years, beginning from Condorcet's idea that each juror has some probability of coming to the correct conclusion about the defendant's guilt or innocence. Suzuki used three different probabilities to calculate the likely decision of a jury, including the probability that the defendant is actually guilty, the probability that a juror will make the correct decision if the defendant is guilty, and the probability that a juror will make the correct decision if the defendant is not guilty. Suzuki's model suggests that smaller juries are more likely than larger juries to convict when the defendant appears less certain to be guilty. All the juries he modeled are very likely to convict when the evidence suggests that a defendant is almost certainly guilty. But for slightly less certain cases, differences become clear. If it appears that there's an 80 percent likelihood that the defendant is guilty, then Suzuki's model suggests that less than 10 percent of the time a 12-person jury would unanimously vote to convict, but a 6-person jury would unanimously vote to convict over 25 percent of the time -- and a Louisiana-style jury that can convict with nine out of 12 votes would convict in roughly 60 percent of such trials. Suzuki admits that the models may not be capturing the complete picture. Even if states that use fewer than 12 jurors had higher conviction rates than other states, that wouldn't mean smaller juries convict greater numbers of innocent defendants, he said. One potential problem with translating this research to real world trials is that it leaves out the interaction between jurors, which Suzuki admitted is a problem. "We don't have a good model for how jurors interact with each other," he said. "The real challenge is that the data doesn't really exist." In addition to the issue of juror interaction, the [Suzuki’s] models leave out other factors important to finding the correct verdict, such as the possibility that testimony or evidence could deceive the jury, said Bruce Spencer, a professor of statistics at Northwestern University in Evanston, Ill., who did not work with Suzuki. "If the evidence is very misleading, it's going to tend to mislead all of [the jurors]," said Spencer. In a separate study, Spencer analyzed surveys completed by judges just before juries delivered their verdict and compared what the judges thought to the juries' decisions, finding that the verdicts agreed about 80 percent of the time. He found that in about one in every five trials in his study sample, the judge and the jury came to different conclusions. Real data on the true guilt or innocence of a defendant on trial is simply not available. The jury's decision is only half the story of a verdict's accuracy. Many factors in jury decisions cannot be captured quantitatively. "If you're coming up with a measure of the speed of light or a standard kilogram, you like to have some assessment of uncertainty," said Spencer. "I think it is difficult to assess the uncertainty of our estimates." Although Spencer knows either the judge or jury must have been wrong in the 20 percent of cases in his study when the two disagreed, there was not enough information to know which was correct in a given case. Using statistical modeling, he found that overall the judges and juries were about equally accurate, but cautioned about drawing conclusions based on the limited number of cases in his study. Suzuki is trying to figure out more about verdict accuracy with his research. He said that he can build estimates of false conviction rates by counting how many verdicts are later overturned. The estimates are imperfect, he said, especially given that new technology such as DNA testing was not available when some of the original verdicts were given. But Suzuki feels that his research can at least examine some of the important details of jury trials. Making better models helps to draw general conclusions, despite the uniqueness of each trial. "You can use probabilistic methods to model human behavior, provided that you understand what the statistics are and are not telling you," said Suzuki.